Bioinformatics could be one of those areas where problems like ‘substring with concatenation of all words ‘ might be relevant. Here we are actually looking for a sequence within a larger string, and this sequence has to be a concatenation of a given set of words, all of equal length. 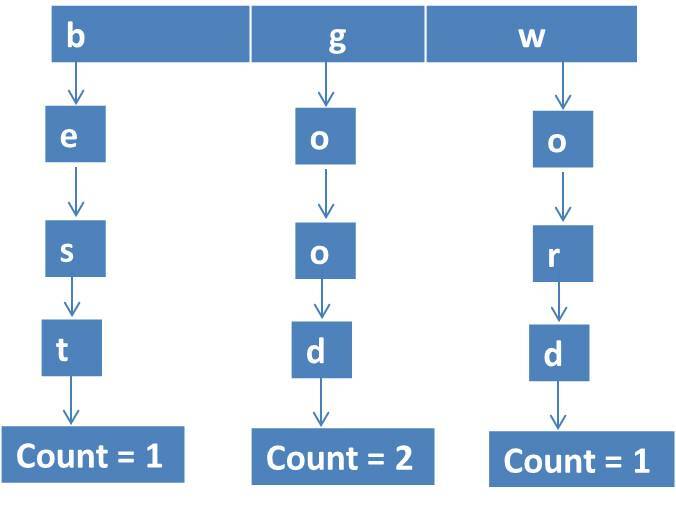 For example, for the string “”wordgoodgoodgoodbestword”” and the given set of words [“word”,”good”,”best”,”good”], the solution should return index . Note that this concatenation of words can happen in any order. Even though the previous example had only one index, the solution should identify all the instances of such sequences. For example, given “aaaaaaaa” and word list [“aa”,”aa”,”aa”], the solution should return indices [0, 1, 2]. A brute force approach would involve scanning every offset of the string seeking for matching words within the list. So for a string of length n and a word list of size m containing words of length k, the complexity would be O(n x m x m x k). An improvement over the brute force approach would be to sort the word array, now the time complexity becomes O(n x m x Log(m) x k). So the primary problem is about quickly identifying whether there is a matching word corresponding to a substring at some offset. Seems like a data structure like trie is ideal for such an operation. 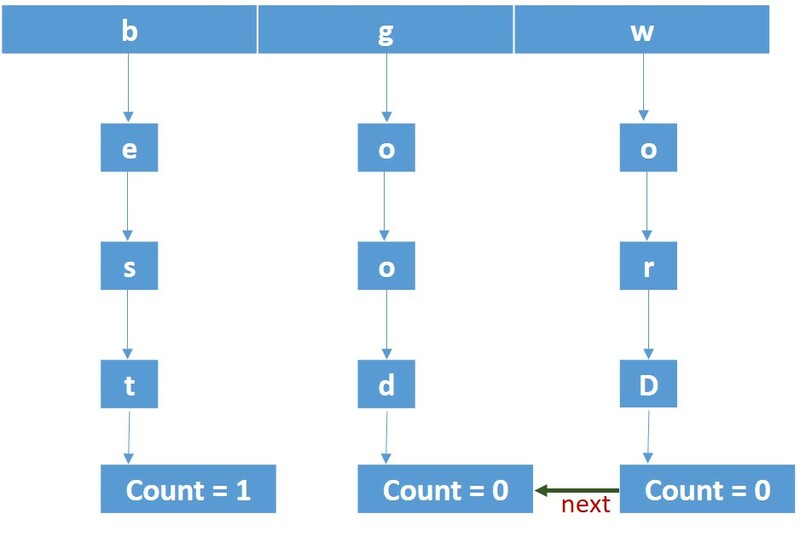 A trie for the list of words [“word”,”good”,”best”,”good”] is illustrated above, we can use this to improve the speed of the sequential scan operation. From the data structure it’s evident that the time complexity for a string search would be O(k). Note that such a tree needs to also handle duplicate words, hence the variable “count” which keeps track of the number of instances of that word within the list. In case of the above example, “good” happens to have a count equal to 2. Use of trie can further reduce the overall time complexity to O(n x m x k). But the obvious trade-off is the overhead of creating this tree. Structure of a trie node used in this algorithm is illustrated below. Each trie node can have up to 26 children, please note that here we assume the comparison is not case sensitive, otherwise we would need 52. Variable ‘tcount’ records the total number of instances of a word on the list. And the variable ‘count’ is used for keeping track of the number of times a word is encountered on the main string. It is initialized with the same value as ‘tcount’ but decremented during the scan whenever the associated word is found on the main string. Consider scanning of the string “wordgoodgoodgoodbestword”, ‘count’ for the word “good” would be decremented to 1 as soon as it’s encountered for the first time at the offset 4. So when ‘count’ reaches zero, it actually means that a valid sub-string cannot have any more instances of that word. Here as soon as the algorithms encounters the third instance of word “good” it would realize that the sub-string starting at 0 is invalid, because even though “good” is present in the list its ‘count’ is now zero. So now we want to restart the scanning from the next offset 1. Before restarting this scan we need to also revert the variable ‘count’ to ‘tcount’. This would mean that we have to keep track of the nodes decremented during the last scan. Here we can utilize the ‘next’ pointer field. During the previously failed scan which started at offset 0 our algorithm would have used the next pointer to generate a linked list of encountered words. The above example would generate a link from “word” to “good”. Please note that during the scan the word “good” was encountered after “word”, hence the link in that direction. Now we can run through this linked list and quickly reset the counters which were decremented. Obviously this linked list would be dismantled as soon as the reset is done. It’s merely an optimization to quickly revert the trie to its original pristine state. The function which implements the main logic is given below.